Of all the buttercreams in the world Italian meringue buttercream might just be my favorite! It’s light, silky, not too sweet and it pipes beautifully!! It needlessly intimidates way too many home bakers so I’m here to help and provide that little bit of encouragement and know how to help you make this amazing frosting! I’ve had many questions about Italian buttercream so I made a step by step video! Scroll down to check it out. You can also watch my make it in my strawberry cake video. Just skip to the 2:45 mark. Did you know Italian meringue (same recipe without the butter) is incredible on tarts and baked Alaska! **Note: it’s important to use room temperature egg whites and butter. Monitor the temperature of your sugar syrup — add your pieces of butter slowly — and let your buttercream sit. You’ll need to give it a quick whip to bring it back to life. I know it’s a bit finicky BUT this buttercream adds a silky, not too sweet, touch to your cakes. It also pipes beautifully! Want some tips on how to use this buttercream when decorating a cake? Check out my How to Decorate a Cake post, it has lots of helpful tips and a full how to video. Cream of tartar is added to help stiffen the egg whites. It’s an acid so if you can’t get your hands on it sub in an equal amount of white vinegar or lemon juice. I’ve made it without and the recipe turned out fine by the way. 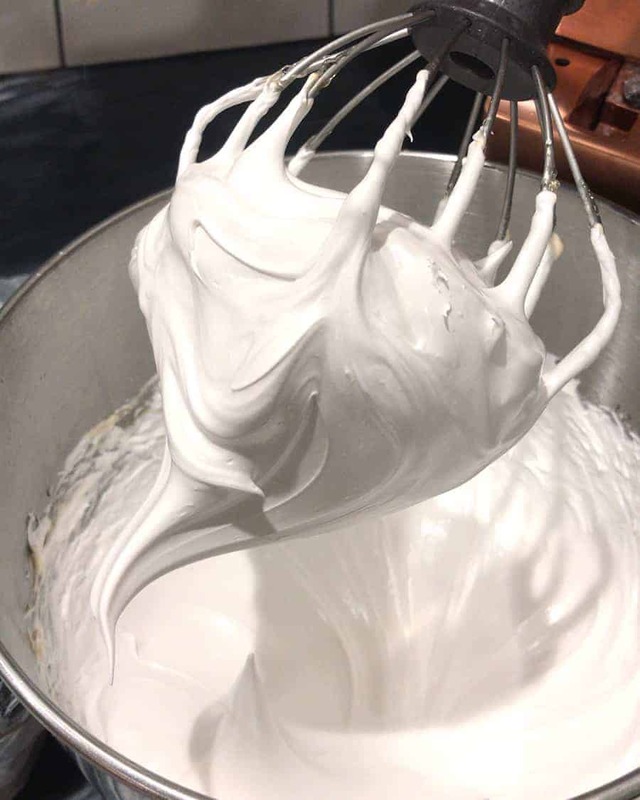 After adding in the 240F sugar syrup your meringue will look very silky, white and it will feel marshmallowy, and not warm when you touch it. As soon as you add the butter in the consistency will change and it will deflate a bit. Don’t worry, that’s fine! Just keep adding all of the butter in and whip. If it’s still soupy you can pop it in the fridge or freeze to cool down a bit maybe 10 minutes, then keep whipping and it should be fine! I love flavoring my buttercreams with a high-quality vanilla extract, but there are so many more flavors to choose from. Orange blossom water, rose water, fruit reductions (make sure they’re strained and cooled before adding), and of course chocolate (melted and cooled). 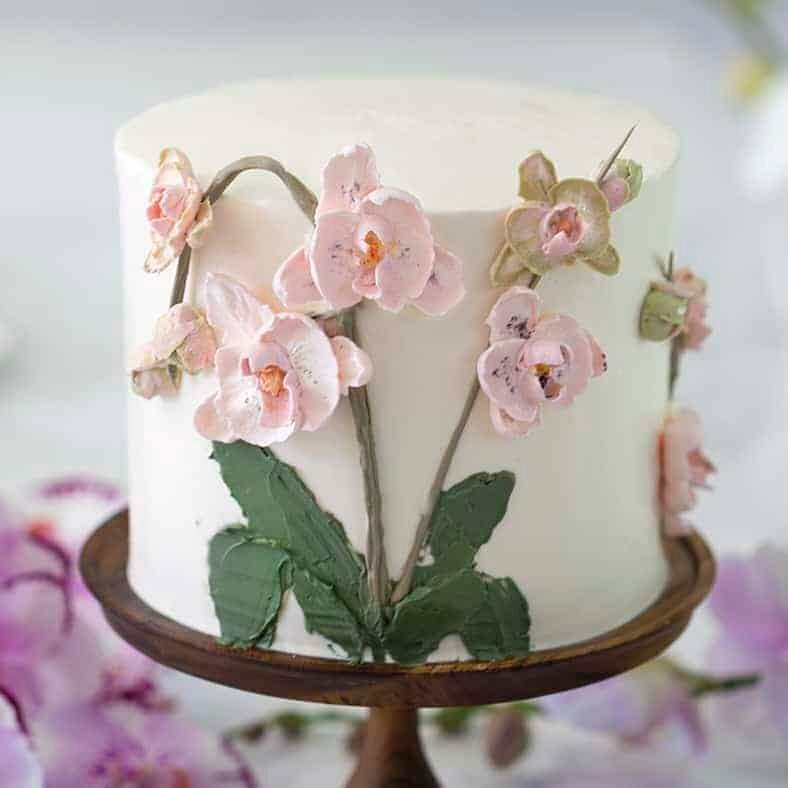 My brown butter orchid cake is decorated completely with Italian meringue buttercream. You might not be able to taste how good it is but I hope you can see the smoothness and detail possible with this frosting. Common Problems: If your buttercream is “soupy,” just pop it into the fridge for a couple of minutes, then beat it. It should thicken up. I find consistency problems arise mostly from the meringue being too warm when the butter is added. Chilling it will help improve the consistency. If you’re adding flavorings (i.e. chocolate, fruit, etc). to your Italian buttercream, I suggest doing this as the very last step. What are the three types of buttercream? The three most common types of buttercream are Italian meringue buttercream, Swiss meringue buttercream and American buttercream. French buttercream, which uses egg yolks for a custard-like frosting, and German buttercream are also delicious options I would urge you to try out. What is the difference between American buttercream and Italian buttercream? Italian buttercream is meringue-based and very light, creamy and less sweet than American buttercream. American buttercream is sweeter but has the advantage of being quick, easy to make, and sturdy. Storage:If you’re not using your buttercream IMMEDIATELY — and it will be sitting for a few minutes — then just keep in mind that you will have to give it a short whip to “bring it back to life” as it loses its consistency quickly. If you want to make the buttercream ahead of time, it can be refrigerated for a few days. Once you’re ready to use it, allow it come to room temperature and give it a short “whip.” For those people that are used to regular buttercream: Italian buttercream is LESS SWEET and more BUTTERY! You can always add MORE SUGAR SYRUP to your meringue to sweeten it a bit further. How do you make Italian buttercream frosting? 1. In a medium saucepan add 1 cup sugar and 1/3 cup water, then place on medium-low heat. 2. Stir until sugar melts and becomes clear. Use a kitchen thermometer to maintain a medium-high heat. 3. 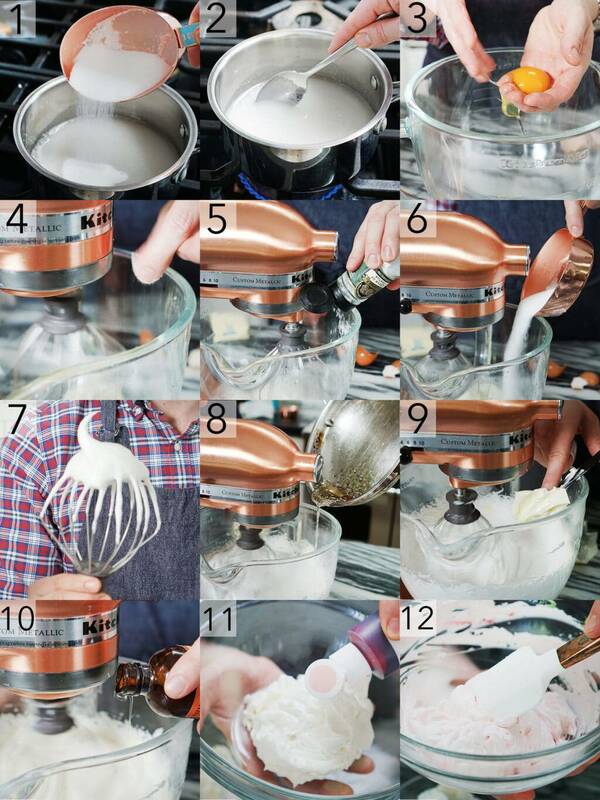 Separate room temperature egg whites into a stand mixer. Beat the egg whites. 6. Add the remaining sugar. 7. Beat until the soft peak stage. 8. When the temperature reads 235F-240F, drizzle the sugar mixture into the mixer immediately. Run the mixer until meringue is cool/tepid. 9. Switch to a paddle attachment. Add room temperature butter into running mixer one tablespoon piece at a time. 10. Add vanilla or any other flavors. Beat until butter is combined and mixture has reached a silky consistency. 11. Transfer the buttercream to multiple bowls. 12. Add a drop of food coloring to each and mix until a desired gradient is reached. 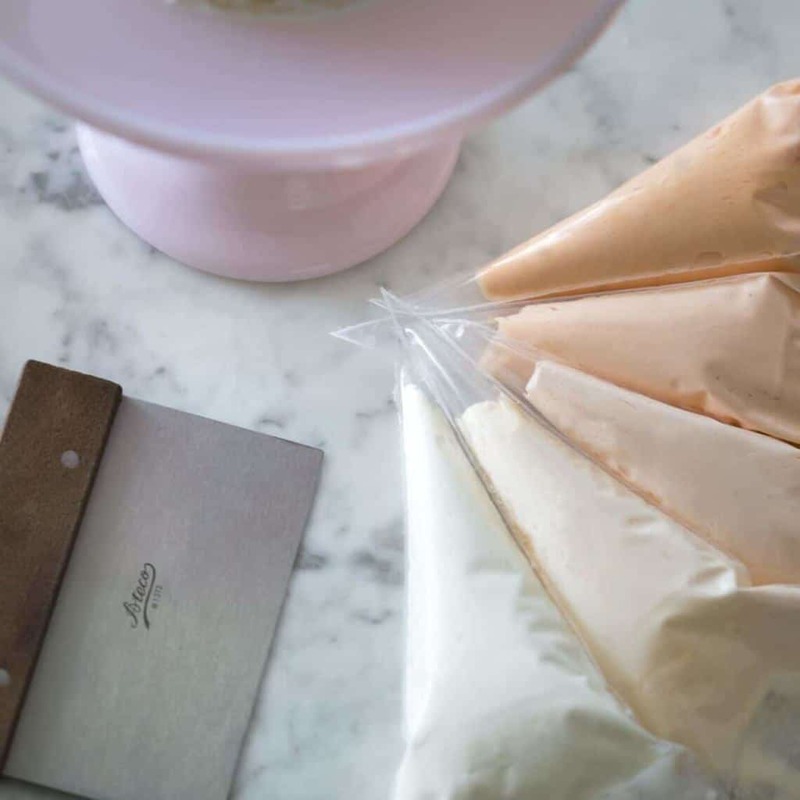 If you’ve tried this frosting then don’t forget to rate the recipe and let me know how you got on in the comments below, I love hearing from you! Recipes Featuring IMBC You Might Like To Try! I made it tonight and added caramel for flavor. It is exquisite! Like you ‘I’m in love!’ I was scared something will go wrong but it helped that Inplayed your video while I was making it. Thank you! Looking forward to try some more of your recipes! I’m glad the the video helped! It sounds like the buttercream turned out great. I’m sure it was so delicious! What will you bake next?? Awesome recipe. Followed your written instructions and the frosting was perfect. Just made 1/2 load which was plenty for the cupcake recipe, which was also awesome. Made these for my wife just because. She loved them. 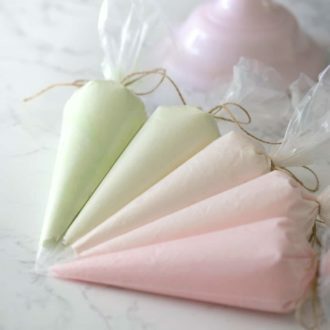 Side note, I’m an amateur ice cream/frozen custard/frozen yogurt maker and my frozen yogurt bible uses the Italian meringue as the the sugar base which gets folded into the Greek yogurt Which is the final base then you go nuts with flavorings/add ins. Seems the Italian meringue has a number of uses. Something this good shouldn’t be this easy to make. I’ll be trying some of your other recipes. I’m so happy you liked it and I might need to try that frozen yogurt! I’m so happy it worked out! I would maybe chill the frosting after coloring, then bring back to room temp and whip up. I think that will work for the color. I am hoping to make your Vanilla Cupcakes paired with this Italian Swiss meringue buttercream. Can I use the boxed egg whites? for this amazing recipe !!! With your tutorial and Great explanation and those who are writing comments with questions thank you for you all to..
even I the amature one can make a simple wedding cake for my Cousin !! I add the chocolate white couvetured , lemon juice, and lemond grated its so Amazing !!! So delicious With Genoiche !!! I Just put my flower in the gardens ( no pesticide ) and Voila !! Baaammm !! I loved this recipe and found it easy to make. However, my icing did not turn out white at all, more a creamy ivory. I am in the UK and used unsalted butter. Is there something else I can try? Do you have different whiter butter in America? I really need white icing for my granddaughter’s christening cake in a few months time and would like to use this type of butterceam. We have MANY shades of butter in the US. I try to use the lighter colored brands as the more yellow ones do give an ivory hue to the final product. Most American butter has a large content of water in it, which is why it is paler. European butter has less water, so it is yellower. This is usually seen as a plus for England and Europe. 😏 I’ve seen stark white food dyes, which might help your problem. Also, when you decorate your cake with strong colors, a cream-colored icing will look much paler in contrast. This buttercream is so delicious. Its my go-to for Italian Buttercream. I made this and it is delicious! Can I ask what kind of dark chocolate you used specifically? I’d like to buy exactly what you used.